The downstairs loo is often the smallest room in any given house; tucked away by the front door or under the stairs, it’s all too often a space that goes a little neglected. Due to the general size of downstairs bathrooms, there is sometimes a hesitancy when it comes to decorating, with people believing that a small space cannot take on a heavy design scheme. However, I believe that the downstairs loo is the perfect place get a little creative when decorating it. Since you don’t tend to spend an excessive amount of time in the area, it can afford to be designed in a dramatic and exciting way. Once you have your basics, a toilet and sink, you can really begin to play around with the scheme, creating your own little paradise that you get to visit a few times a day. To make a big statement in a small space you must first be decisive about which direction you want to take. Big features can look amazing but include too many and the space may become a little claustrophobic; here are a few ideas to get your thinking about how you could best design your downstairs loo. When you have guests over for an evening, often the cloakroom will be the only bathroom they see, so creating a show stopping space will really make a strong design statement. Adding a patterned wallpaper to your loo can be a great way to give the space its own sense of character. 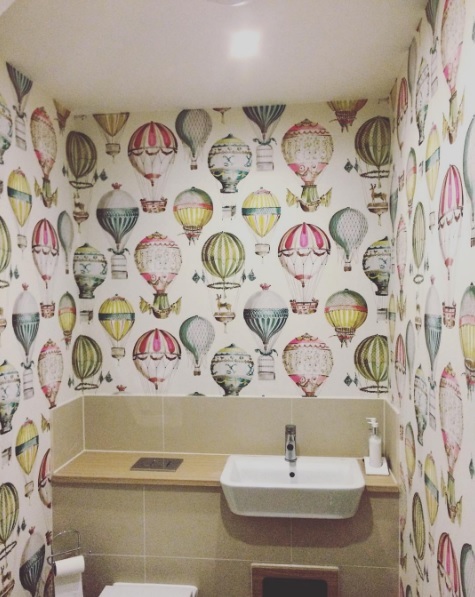 On a recent project we decorated a client’s downstairs bathroom with this fun Manuel Canovas wallpaper, L’envol, which really gave a bland space a bit of impact. There are so many styles you can opt for when it comes to choosing a wallpaper with flare for your loo. I’m head over heels for this flamingo print from 17 Patterns in pink. It’s a fantastically designed pattern that will look amazing in a downstairs loo, really giving the space a strong, bold look without being overbearing. If you’re general aesthetic is more traditional, but still vibrant and colourful, a charming design like this Secret Garden pattern from Juliet Travers in midnight blue will help create a sweet but dramatic effect in the small space. The enchanting pattern teamed with the perfect lighting will create a fairy-tale like space. If you have the advantage of additional floor space on your side, a few plants strategically placed will really transform the place. If you have a few different surface heights, for example the floor a countertop and maybe some shelving, building your own small jungle of plants in different varieties and sizes will give a depth to your space, making a strong statement. When it comes to plants, of course it depends on your preference, but I believe more is more, and an overflow of bohemian style succulents, cacti’s and tropical pieces will really create an impact as opposed to one, lonely plant. If you’re short on sunlight, a quality faux plant can look just a good as the real thing, plus if you’re opting for a plant of the spikey variety there’s no chance of a painful accident! Abigail Ahern does some of the best artificial plants and flowers around, I love this array of cactus; they’ll really help to build up your plant portfolio. A lack of floor or surface space shouldn’t deter you from adding some foliage to your bathroom. This wall garden from Rockett St George is a great example of how you can really get creative with plants in your home, and in your loo. Vertical gardens are a fantastic and innovative way of using your space selectively but still keeping a fresh and current aesthetic. You can buy a readymade one, real or faux, or if you want a project, creating you own one is the perfect way to include everything you want to and design with you own vision. Sometime the downstairs loos is fitted into a rather tight space in the home, which might make you think that there is only room for the bare necessities, but you can always create more space with the use of carefully planned shelving. The trick is, in a small space making sure you put up your shelves somewhere where you won’t be knocking into. Once you have this figured out you can pick a shelf that matches your style and begin to fill it with a mix of ornamental and usual items, creating the perfect design balance. These industrial style shelves from Cox & Cox are sweet; their light design means that they won’t feel like they take up more room than they actually do, and the open nature of them makes them ideal for carrying objects of various heights and sizes. Another shelving design I love is from Anthropologie, although these are slightly less functional then your conventional pieces, they are so pretty they’d make the perfect design feature. Often you find downstairs loos located under the stairs, these shelves would look lovely ascending in size order up a sloping wall. 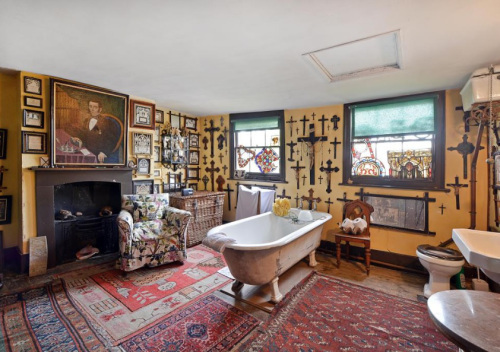 Whenever I think about inspirational bathrooms, I always think back to the beautiful image of the bathroom in Malpalquet House in East London, which I wrote a blog on some time ago. The bathroom wall was covered in pictures, frames and crucifixes, which overall created a beautiful effect. While you may not be able to squeeze all of this into you downstairs loo, you can certainly create something that’ll make an impact. If you have a generous amount of clear wall space, you can start to make you own mural of photo frames, prints, painting, mirrors and anything else you can think of. You may want to go down the nostalgia route and use family photos, or pick out arty prints, or even just create a miscellaneous haven. I love these Kiko frames from Nkuku, they come in a range of sizes so you can mix and match and find the perfect fit for your chosen display pieces. Unlike conventional frames, you can change what you want to go in the Kiko frame with ease and swap out or add in items as you find them. A downstairs loo wall covered in the frames will make a beautiful, comforting statement. Using mirrors, in varying sizes and styles is also a good way to create an impact, and also provide a functional aspect to your bathroom. These hanging portrait mirrors from Nkuku are great to add to a collection of mirrors; with some being flatter, some more elaborate and some smaller or larger. A wall covered in mirrors or frames will automatically create an eye-catching feature in a small space. The downstairs loo is often a forgotten about space, or somewhere thought as only a functional room, but there are so many ways to great creative in a small space. It’s an area that you can confidently show off your style and really begin to design an area that’s a fun space.